According to The Sydney Morning Herald, Universal has filed a lawsuit against the Australian politician accused of rewriting a TWISTED SISTER song without permission. Clive Palmer adopted the melody and rhythm of TWISTED SISTER's hit single "We're Not Gonna Take It" in his political advertisements for the United Australia Party. The advertisements feature a vocalist singing the TWISTED SISTER song's melody along with the lyrics: "Australia ain't gonna cop it, no Australia's not gonna cop it, Aussies not gonna cop it any more." In TWISTED SISTER's original, singer Dee Snider sings: "Oh we're not gonna take it, no we ain't gonna take it, oh we're not gonna take it anymore." Universal Music, which acquired Snider's publishing rights in 2015, filed copyright infringement proceedings against Palmer in the Federal Court in Sydney on February 6. The Federal Court dispute is listed for a preliminary hearing before Justice Alan Robertson on March 6. During an interview with "Rock Talk With Mitch Lafon", TWISTED SISTER guitarist Jay Jay French said that despite Palmer's lyric switch, the politician remained exposed to litigation. "This guy Clive Palmer, if we take away his politics, just from a legal standpoint, what he did was illegal. It doesn't matter if you're left, right," the guitarist said. "If you take a song, rewrite the song, make a commercial of the song and it's broadcast, you are violating copyright law. So, again, regardless of what we think about him personally — which is another issue completely — he has broken the law. And because he broke the law, he is being sued by the rights holder of 'We're Not Gonna Take It'." In a January 8 statement, Palmer said TWISTED SISTER's song was based on the 18th century hymn "O Come, All Ye Faithful" and "others may have documented the instrumentation, but the melody was already present. 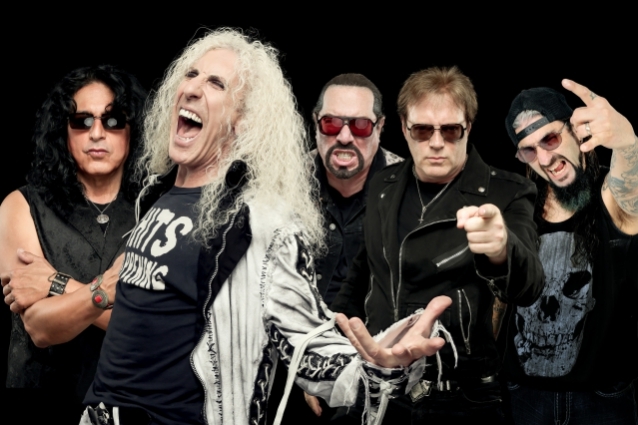 "As TWISTED SISTER never remunerated the original arranger, we do not understand how they have ever had any claim to its copyright," he said. Palmer's other possible defenses, including that he used the song satirically or that he did not use a substantial enough part of the song to warrant legal action, would likely be unsuccessful, in French's opinion. "I understand that [Palmer] originally requested an application to apply for a license to rewrite the song," the guitarist said. "Now, let's just be clear about this. Re-recording songs is a perfectly legal thing to do, so long as you obtain a compulsory license. Almost nobody has ever declined the right to re-record a song, as long as you pay rights holders and you get a license. However, he wanted to rewrite the song, and he requested that. And many times, there are parodies of songs that are rewritten, but they get permission — you have to, because you're using part of an already-registered song. Well, he inquired, from what I understand, and chose to not file for an application and he went on and just decided to do it. And he's supposedly a billionaire. I have no idea what the license would be. Let's just say the license fee was ten thousand dollars, for the sake of this conversation. I have no idea what is. But he chose to not apply or pay — he just went out and recorded it and released it commercially and bought airtime on it, and basically violated the law." Snider, who just completed an Australian tour, called Clive's song "terrible" and "a blatant rip-of" during a recent appearance on the "Today" show. He also pointed out that while it is nothing new for politicians to use songs from popular artists in their campaigns, Palmer's case is different, because he is using "We're Not Gonna Take It" "in a commercial without licensing. To use it at a rally or something like that, that's one issue, and those politicians, like Donald Trump, when asked to stop, they stopped," Snider explained. "But he's using it… [he's] breaking the law. He's a common criminal, in my opinion, and he's stealing my music. He's refusing to pay the royalties that he's supposed to pay to use it in a commercial campaign." As for how he thinks this whole thing will turn out in the end, Snider said: "They're gonna take it to courts, but it's gonna be one of those things where they'll negotiate a settlement. In the meantime, he's already ran his spots and did his damage. And there's people out there who think that I've endorsed his campaign." Last month, Snider took to Twitter to call Palmer "nothing but a lowlife, piece of kangaroo dung, criminal without an ounce of dignity." Back in 2015, Dee gave then-Republican presidential candidate Donald Trump permission to use the song on his campaign trail because they were friends. However, as the campaign raged on, Snider began to develop a greater understanding of Trump's ideology and changed his mind.